Honestly one of my favorite recipes to date! Not my absolute healthiest recipe, but one you need to have in your life ASAP. If you don't need the 6 servings, save the leftovers to cut up for salads, or just to heat up and have again. So delicious! 1. Make sure chicken is defrosted, and make tiny diagonal slices through the top and bottom of each piece to ensure it cooks through well. Set aside. 2. Combine 4 Tbsp. of the butter + all dry ingredients in a small bowl. 3. In another shallow bowl, melt the remaining 4 Tbsp. butter. 4. Take each piece of chicken and dip in the shallow bowl of butter and then directly in the Kodiak Cakes mixture. 6. Your chicken should be browned, cooked through, and your kitchen will smell delicious. Serve immediately. 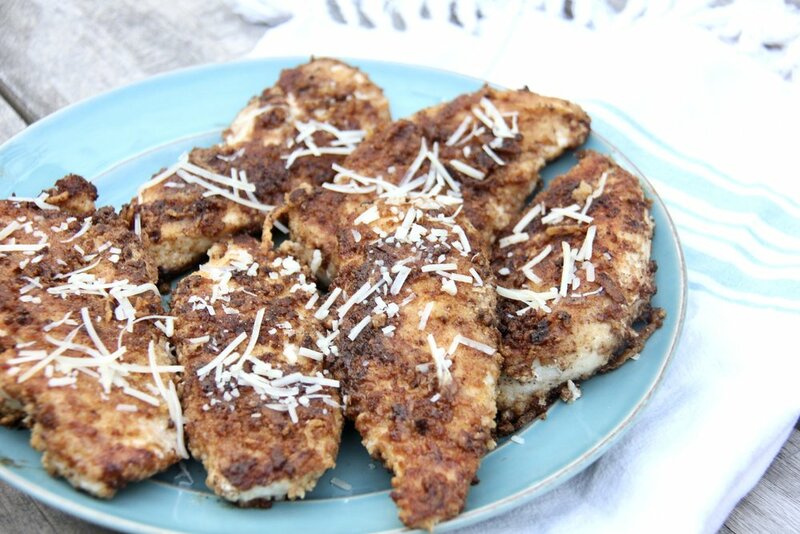 Sprinkle some parmesan cheese over top, and dig in!